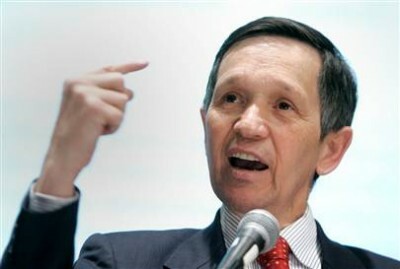 Congressman Dennis Kucinich (D-OH) today made the following statement regarding the announcement that U.S. troops have left the cities and towns of Iraq and turned over formal security to Iraqi security forces. “The withdrawal of some U.S. combat troops from Iraq’s cities is welcome and long overdue news. However, it is important to remember that this is not the same as a withdrawal of U.S. troops and contractors from Iraq. “U.S. troop combat missions throughout Iraq are not scheduled to end until more than a year from now in August of 2010. In addition, U.S. troops are not scheduled for a complete withdrawal for another two and a half years on December 31, 2011. Rather, U.S. troops are leaving Iraqi cities for military bases in Iraq. They are still in Iraq, and they can be summoned back at any time.